1 Preheat the oven to 180C, gas mark 4. Line a 900g loaf tin with baking parchment, making sure the paper comes up higher than the sides. Beat the butter and sugar together until light and fluffy. Gradually add the eggs with a little of the flour and beat well. Fold in the rest of the flour and the desiccated coconut, then gently fold in the halved raspberries. Spoon the mixture into the loaf tin, levelling out the top. Bake in the oven for 55 minutes to 1 hour 5 minutes, covering after 30 minutes, until risen and golden. 2 Leave the cake to cool in the tin for 10 minutes, then turn out on to a wire rack and leave to cool completely. Meanwhile, spread the coconut shavings out on a baking sheet and cook in the oven for 2-3 minutes, until lightly toasted. 3 Give the Co Yo a stir and then spread over the top of the cake. 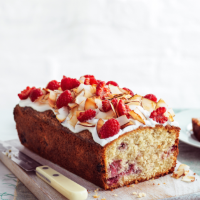 Sprinkle the torn raspberries and toasted coconut over the top.